A 33-year-old mother from Lakewood had the misfortune to be one of just 165 people in the U.S. to get acute flaccid myelitis this year. She’s grateful to be home and recovering. The polio-like illness is so rare that only 165 people in the U.S. have had confirmed cases this year. It’s called acute flaccid myelitis or AFM. Emily West survived a rare polio-like illlness and is thrilled to be home and recovering with her husband, Jarrod, and their two young sons. Photo by Cyrus McCrimmon for UCHealth. The chances of getting AFM are extremely rare: about one in a million. But strangely, Colorado has the second highest tally of cases in the U.S. this year, just behind Texas, according to the U.S. Centers for Disease Control and Prevention. States like California and New York have far bigger populations than Colorado, but each has reported just a handful of AFM cases in 2018. Colorado, meanwhile, has 15 confirmed cases (plus one more suspected case) or nearly 10 percent of all reported cases in the U.S. this year. Health officials first detected a handful of AFM cases in California in 2012. Then, in 2014, Colorado had an outbreak of the disease. AFM causes weakness in limbs, sometimes on one side of the body. Cases of AFM oddly have seemed to go dormant, then reemerge every other year during the late summer and fall, with additional outbreaks in 2016 and again this year. The vast majority of cases have been among children, and some victims have had to cope with lasting paralysis. The disproportionate number of AFM patients in Colorado may stem from doctors here being better at diagnosing and reporting the illness. Or, it’s possible that the viruses suspected of causing AFM may be more common in Colorado, health experts say. Researchers are racing to understand the causes and potential treatments for AFM. Meanwhile, a Colorado patient who survived a recent bout with the illness is recovering and counting her blessings. Emily West is a young mother from Lakewood. While she had the misfortune of getting the debilitating disease, Emily is not dwelling on the hardships she endured including terrible hallucinations that haunted her during a seven-week hospital stay. Instead, she’s feeling euphoric and grateful. Emily celebrated her 33rd birthday on Sunday with her husband, Jarrod West, and their two young sons, Ollie, 4, and Teddy, 2. Her mom, Betsy Brock, made Emily’s favorite meal: matzo ball soup and latkes. The family endured some very scary moments along the way. But now that they are through the worst of it, they are all feeling incredibly grateful. Emily can walk and talk again. She sometimes hesitates slightly when she’s speaking. But, her speech and movement continue to improve each day. Her fingers, hands and wrists were sore and weakened before AFM from rheumatoid arthritis, an ailment Emily has suffered from since age 23. The weakness now stretches up into her arms and shoulders. It’s hard for her to pick up the boys. And she doesn’t yet have enough strength in her fingers to buckle the kids into their car seats. She also can’t drive yet because she’s still working to speed up her reaction time from her brain to her foot. Emily West had to be in the hospital for seven weeks after a rare polio-like illness attacked her body. Shes thrilled to be recovering and back home with her two sons, Ollie, 4, and Teddy, 2. Photo by Cyrus McCrimmon for UCHealth. Still, with regular speech, occupational and physical therapy, she continues to improve and looks forward to getting back to work in 2019 as an ultrasound technician at a fertility clinic. “Everything aligned perfectly to have the best outcome we could have had,” said Jarrod. For Emily, simple everyday moments now feel like miracles. She was able to leave the hospital and come home on Oct. 5. At first, the Wests’ younger son, Teddy, was shy, while Ollie was protective. “Take it easy mommy,” Ollie said as Emily climbed the steps to the front door. Then he handed her one of his favorite stuffed animals: a little brown bunny. “You can have this mommy,” Ollie said. While she often gets tired, Emily rallied to celebrate Halloween just three weeks after her release from the hospital. She dressed up as a crow, Teddy was a dragon and Ollie was Spider Man. Emilly West is thrilled to be home for Christmas. Photo by UCHealth. The Wests celebrated Thanksgiving with both sides of the family. Now, they’re gearing up for Christmas. 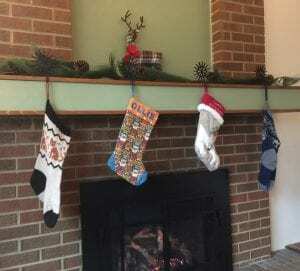 The stockings are hanging over the fireplace. Emily and Jarrod took the boys to see Santa and they recently enjoyed an evening at the Zoo Lights, which involved quite a bit of walking. Emily managed to make it all the way around the zoo as lights twinkled overhead. “I was so proud of myself,” she said. 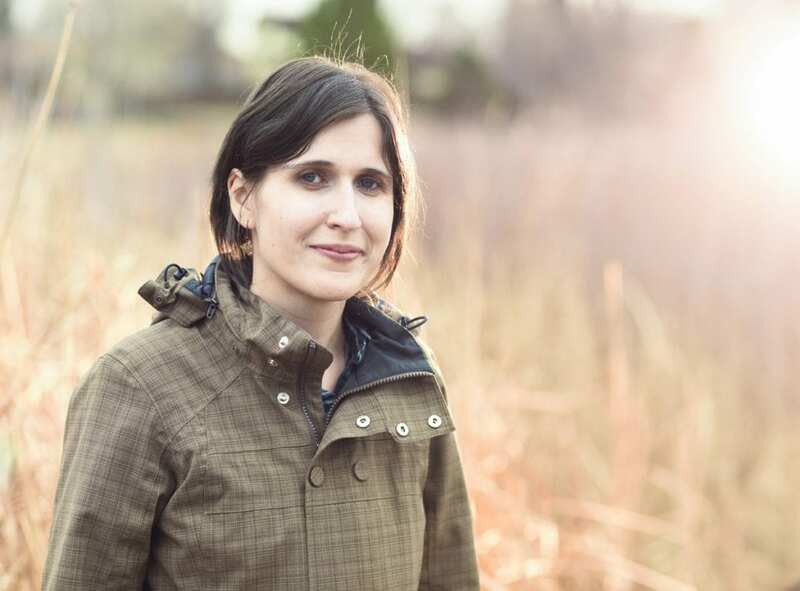 Emily’s ordeal began in August with what seemed like a simple cold. Then, she started having aches that advanced up both legs and into her lower back. 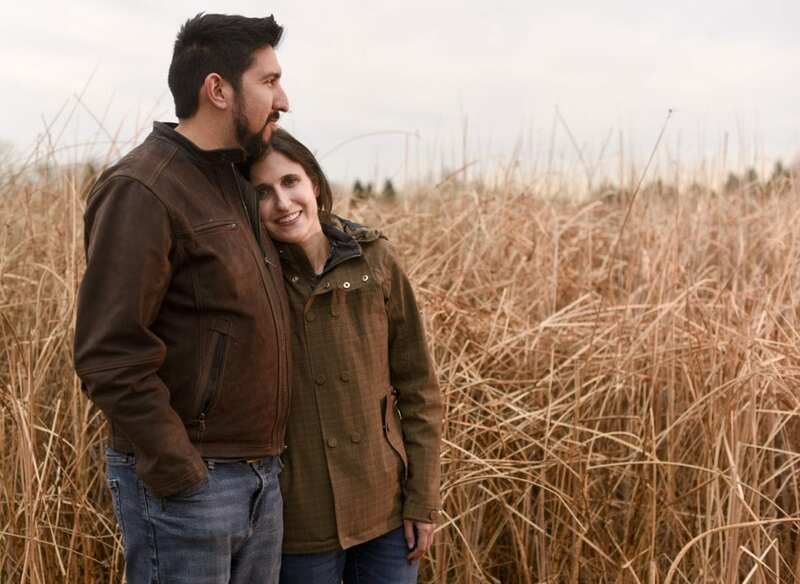 When the pain got really severe on Aug. 18, Jarrod took Emily to a hospital in Lakewood. She was declining fast. She could no longer control her muscles. Her legs crumpled beneath her. She couldn’t eat on her own. A ventilator had to breathe for her. Doctors in Lakewood knew Emily had both encephalitis — swelling or infection in the brain — and myelitis — swelling or infection in the spinal cord. But, they didn’t know precisely what was causing it, so they consulted with colleagues at UCHealth University of Colorado Hospital in Aurora. There, the neurohospitalist on service at the time happened to be an expert on AFM and infectious poliomyelitis. 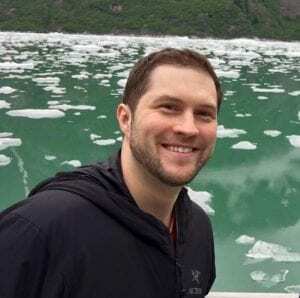 “It was random that I was on service that week,” said Dr. Daniel Pastula, who is also a medical epidemiologist who has studied infectious disease for years and is an assistant professor for the University of Colorado School of Medicine. Dr. Dan Pastula recognized that Emily West had a rare illness and was part of a team that helped the young mother survive. Photo courtesy of Dan Pastula. Pastula needed ankle surgery and was supposed to have been out in August. But the surgery got postponed, which meant he was at the hospital exactly when Emily needed him. Emily had the telltale signs of AFM in her spinal cord. And, it was the right time of year to suspect the illness. Most cases of AFM occur in August, September and October. Doctors suspect that the seasonal tie is linked to various enteroviruses that are common during the late summer and early fall. Emily initially tested positive for enterovirus infection, but at first, doctors didn’t know which type had sickened her. They later confirmed that she had a very specific strain called A-71. It’s a cousin of the polio virus, and for Emily, it proved very dangerous. “She was critically ill,” Pastula said. A medical crew in Lakewood loaded Emily onto a helicopter and flew her to University of Colorado Hospital. There, the race to save her life began. One of the biggest challenges Emily faced is that her immune system was compromised. She had been taking a medication for her rheumatoid arthritis called rituximab, which suppresses part of the immune system that helps make antibodies. The lack of immunities hit Emily doubly hard. First, she was vulnerable to viruses, including ones suspected of causing AFM. Then, without sufficient antibodies, her body struggled to fight the virus. “We thought she wasn’t making enough neutralizing antibodies against whatever enterovirus strain this was,” Pastula said. Emily West is one of just 165 people in the U.S. this year to have gotten a rare polio-like illness called AFM. Photo by Cyrus McCrimmon for UCHealth. It’s been hard to identify the cause for AFM because by the time the weakness develops in patients, the suspected virus is usually gone. In Emily’s case, since her immune system wasn’t able to clear the virus quickly, doctors were able to detect the exact strain of enterovirus — A-71 — in her spinal fluid. While no one ever would have wished for a young woman with suppressed immunities to get sick, Emily’s struggle has uncovered clues about the mysterious illness. “She has helped us figure out for the rest of the country one of the potential causes of AFM,” Pastula said. Emily suspects she picked up the virus at the boys’ daycare center. Health experts say that enteroviruses are quite common and were certainly circulating in the fall at childcare facilities. Hand washing is the No. 1 recommendation for avoiding viruses. But, it’s difficult to avoid them when you’re around children. 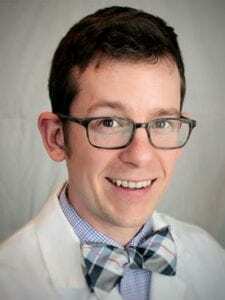 Dr. Jeffrey Lewisis a family medicine doctor at UCHealth Family Medicine Clinic in Boulder. Lewis has been fielding more and more questions from parents eager to protect children from AFM. (The disease primarily has sickened children, but can strike adults.) The disease is quite rare and Lewis has not seen any children with it. But, the advice for preventing viruses and AFM is similar to avoiding other infectious diseases. Wash hands frequently with soap and water, especially before eating, after using the bathroom and after diaper changes. If you are sick, avoid contact with others, especially those who are most vulnerable, including the very young, elderly people and those with compromised immune systems. Wear a mask if you have a persistent cough. Your child is lethargic and has a high fever. You notice any paralysis, weakness or difficulty in a child’s ability to move his or her limbs. A child is having difficulty walking straight. A child complains of a severe headache. You notice any unexplained shortness of breath. Some enteroviruses cause stomach illnesses, while others generate respiratory sickness. Most infections are not serious. In Emily’s case, however, the particular strain she contracted proved especially dangerous with her suppressed immune system. “I think she was just really unlucky,” Pastula said. He works closely with other AFM experts at the Colorado Department of Public Health and Environment and at Children’s Hospital Colorado, where most of the young AFM patients have been treated. There are no proven treatments yet for either AFM or enterovirus infections. However, in Emily’s case, Dr. Pastula and his team recommended giving her intravenous immunoglobulin or IVIG as he doubted she was making enough of her own antibodies to fight off her enterovirus infection. Emily faced many additional challenges including bouts of pneumonia, but she managed to improve over time. Pastula is thrilled that she’s doing so well. “I’m so glad we could help figure out what was going on. And more importantly, I’m glad we could get her back to her family,” he said. For Emily, the first weeks in the hospital were extremely frightening. She had terrifying delusions. Unfortunately, for people with brain infections, vivid hallucinations are common. Emily was convinced that she was a hostage and if she didn’t pay a large sum of money, she’d never see her children again. Emily West had terrible hallucinations during her illness. 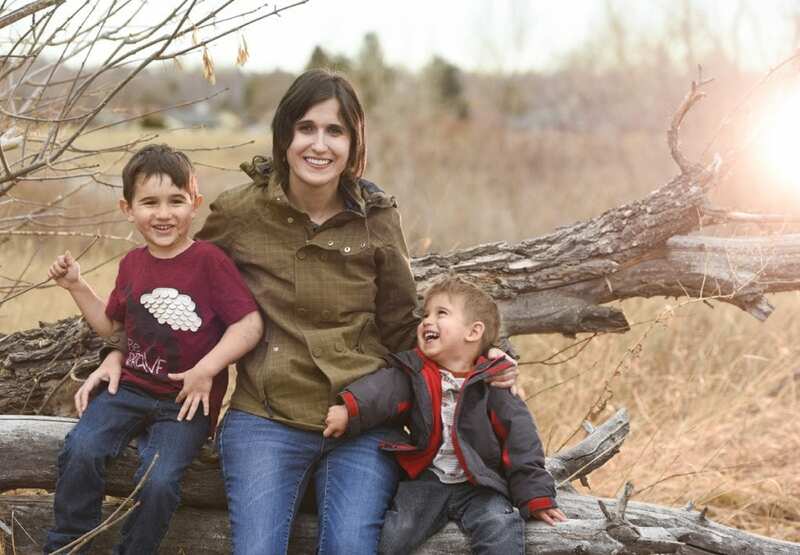 She thought she had been taken hostage and would never see her two boys again. Now, she’s overjoyed to be back home with them. Photo by Cyrus McCrimmon for UCHealth. “I thought I was being tortured. I thought I owed them money and I couldn’t give it to them,” she said. For her family, the ordeal was equally scary. Jarrod and Emily are high school sweethearts from their days at the Jefferson County Open School. They first met on a canoe trip to the Boundary Waters in Minnesota. Jarrod always had a strong conviction that his wife would survive. He feared, however, that she might end up severely disabled. Uncertainties hit him hard in the hospital. He started suffering panic attacks every time he rode up the elevator to the Intensive Care Unit. “I had never in my life experienced a panic attack. But you get a sense of dread. My heart rate would spike. I felt this exhaustion in my muscles and bones,” said Jarrod, who is a supervisor for RTD. He, Emily’s mom and other family members took turns trying to keep things as normal as possible for the boys, while also keeping a vigil with Emily. Jarrod would talk to Emily even when she was unconscious. Ollie was playing on his first soccer team and Jarrod told Emily about the practices and games. He kept his messages to the boys as simple as possible. Emily West gets a hug from her mom, Betsy Brock. Photo by UCHealth. Positive turning points helped sustain everyone. Emily’s mom vividly remembers the first time Emily opened her eyes and another day when a single tear dropped from one eye. “I knew you were in there,” Brock said to her daughter. Another time, family members saw Emily’s legs moving, which gave them hope that she might someday walk again. Then, on the day she had her ventilator removed, she smiled brightly. She couldn’t speak yet, but she clearly was thrilled to breathe on her own again. A day later, when Jarrod walked in, Emily reached out to him, hugged him hard and wouldn’t let go. “I was so scared,” she said in a whisper. “For someone who had no muscle control, she was strong,” Jarrod said. It was sad to know how frightened his wife had been. But clearly she was doing all she could to fight her way back. 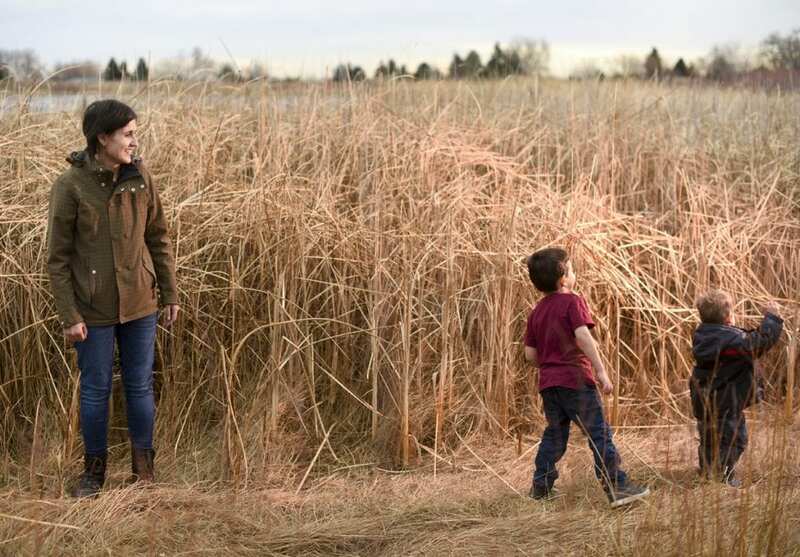 In Colorado so far this year, there have been 15 confirmed cases of AFM and there is one additional suspected case, said Dr. Rachel Herlihy, the state communicable disease epidemiologist for the Colorado Department of Public Health and Environment. She said all of the Colorado cases this year have clustered around the Denver metropolitan area. AFM has affected young children and three adults. Most of those sickened this year have recovered relatively well and it’s a relief that overall, the numbers are low, Herlihy said. “But, it’s still quite devastating to the families that have been impacted,” she said. Health officials across the country are doing their best to try to understand AFM and halt future outbreaks. Thus far, the only way to avoid the strains of enterovirus suspected of causing AFM is to be vigilant about washing hands, especially after diaper changes. “Avoid contact with people who are sick and don’t share cups or eating utensils,” Herlihy said. For Emily and her family, the most exciting progress came once she moved to the hospital’s rehabilitation unit on Sept. 21. 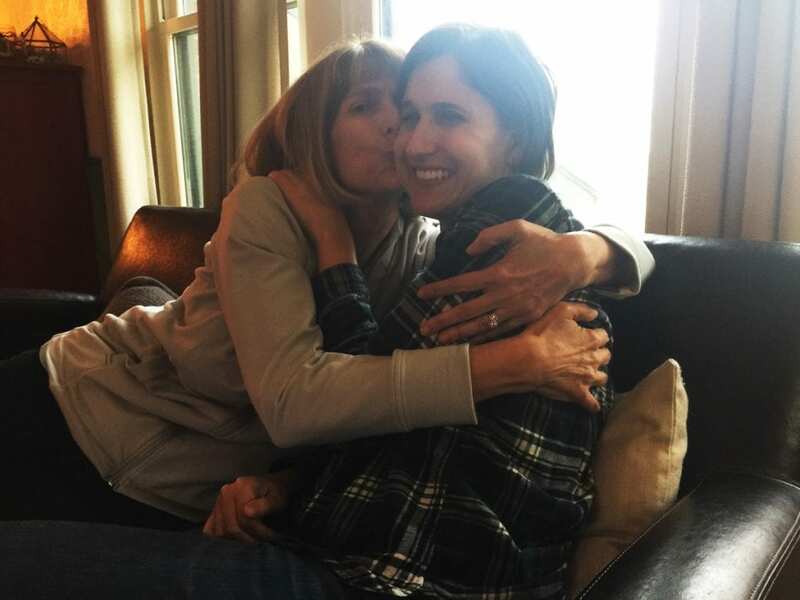 “About five days before she came to the rehab unit, she was starting to make improvements,” said Dr. Bill Niehaus, Emily’s rehabilitation specialist and an assistant professor at the University of Colorado School of Medicine. Dr. Bill Niehaus specializes in rehabilitation care. He and his team at UCHealth University of Colorado Hospital helped Emily West learn to walk and swallow again after she got a virus that led to a rare, polio-like illness. At first, Emily needed two people to help her rise from sitting to a standing position. Soon, however, she was trying to move around with a walker. She started with short distances, shuffling just 100 feet. One therapist would help with the walker, while another was behind her with a wheel chair. “Pretty soon, she was walking over 850 feet pretty much by herself. She increased her distance by over 800 percent,” Niehaus said, still in awe of his patient’s determination and progress. “Part of that is tied to the therapy. But a lot of it was her effort,” Niehaus said. “It’s astonishing that she made the progress she did over such a short time. She’s the epitome of a really, really sick patient who threw everything into her sessions and made huge progress. Emily essentially re-learned the basics of walking in a week. And therapists also helped her learn to swallow again. Both skills would make life much easier at home. “They helped me make so much progress so quickly. My form was not good. I needed to re-learn the movements,” Emily said of her first attempts to walk. At first, she was hunched over and stiff. But, by the time she came home, she was incredibly proud to be standing tall on her own two feet. Balloons and two happy little boys, who hadn’t seen their mom in nearly two months, greeted her. Emily got to take in the beautiful view from their home. Right across the street, a pond stretches out to the horizon. In the foreground, reeds taller than the boys hug the water, providing perfect cover for games of hide-and-seek. In the distance, Emily could see the skyscrapers of downtown Denver. She felt peaceful and serene. Finally, she was home with her family. A disease had taken her hostage, but she had escaped.